Have You Accepted Ben Affleck As Dunkin’ Donuts’ Personal Lord and Savior? You can take the boy out of New England, but you can never really take New England’s favorite coffee and baked-goods chain out of the boy, can you? 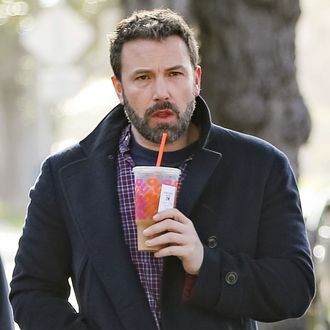 We’ve finally decided it’s time for Ben Affleck to embrace his destiny and become a paid brand ambassador for Dunkin’ Donuts, given that he’s, you know, newly out of a job and just admitted he finds an excuse to go there every damn day as a denizen of iced-coffee epicenter Los Angeles. “It’s amazing! I have Dunkin’ Donuts everyday,” Affleck told Collider about the company’s rapid West Coast expansion. “It’s very weird, I have it every day and people are always like, ‘Where is that? Is that near here?’ So, I feel like I’m spreading the word.” Affleck’s passion for DD’s coffee-flavored sugar milk is well documented and fun to browse, and his brother, Casey, even got to poke fun at the powdery institution on SNL. America runs on brand loyalty — and Dunkin’! Ben Affleck Breaks His Silence on His Back Tattoo: He ‘Loves’ It! Have You Accepted Ben Affleck As Dunkin’ Donuts’ Savior?